PENNSYLVANIA. A great place to race, live and invest in. Take advantage of everything Pennsylvania has to offer your business. Start by becoming a member of the Pennsylvania Harness Horsemen's Association. We're not just a trade group aligned with your interests. Qualifying members can take advantage of valuable benefits including paid participation in an affordable group health insurance plan, on-track insurance and much more. With many race classes, and purses that are competitive with neighboring states, the opportunities to compete are truly inviting. Our member tracks are conveniently located in northeastern PA (The Downs at Mohegan Sun Pocono) and southeastern PA (Harrah’s Philadelphia Casino & Racetrack). There’s always a great place to race within easy shipping distance. The Pennsylvania Harness Horsemen is managed by horsemen, for horsemen. Our mission is clear: “To provide a stable foundation for horsemen by encouraging competitive racing that increases fan participation and enhances the reputation of Pennsylvania harness racing on the national scene.” It’s why we’re more than a horsemen's organization…We Are Pennsylvania Harness Racing®. No wonder our members are setting new records with every meet. And the best is yet to come. So, come join us. Invest in Pennsylvania and become a member of our Association today. Then join our roster of successful horsemen for the 2019 meet. We look forward to welcoming you. 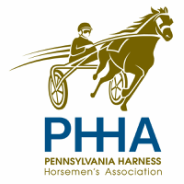 On behalf of the Board of Directors of the Pennsylvania Harness Horsemen’s Association, thank you for visiting our website.